Angry Koala Gear: STEAMPUNK BATTLESTAR GALACTICA: 1880 ARRIVES IN AUGUST FROM DYNAMITE! STEAMPUNK BATTLESTAR GALACTICA: 1880 ARRIVES IN AUGUST FROM DYNAMITE! 1880 ARRIVES IN AUGUST FROM DYNAMITE! TELLS THE TALE OF THIS UNIQUE SERIES! Following Dynamite's incredible success with its first steampunk book, Legenderry, Battlestar Galactica is getting a steampunk makeover of its own with Steampunk Battlestar Galactica: 1880! Written by Tony Lee, with art by Aneke and covers by Ardian Syaf and Sergio Fernandez Davilla. Make sure to pick up Steampunk Battlestar Galactica: 1880 this August! "There's so much about the steampunk aesthetic -- from the Industrial Age metalworks to the Victorian fashion flair -- that Tony Lee and Aneke can explore in the Battlestar Galactica universe," says Keith Davidsen, Marketing Manager at Dynamite Entertainment. "From the Raptors to Colonial pistols, from the Basestar capital warships to the Cylons themselves, fans will thrill to the sight of spacefaring 1880s technology, and to beloved heroes like Starbuck, Apollo, and Athena reimagined in retro-futuristic ways." 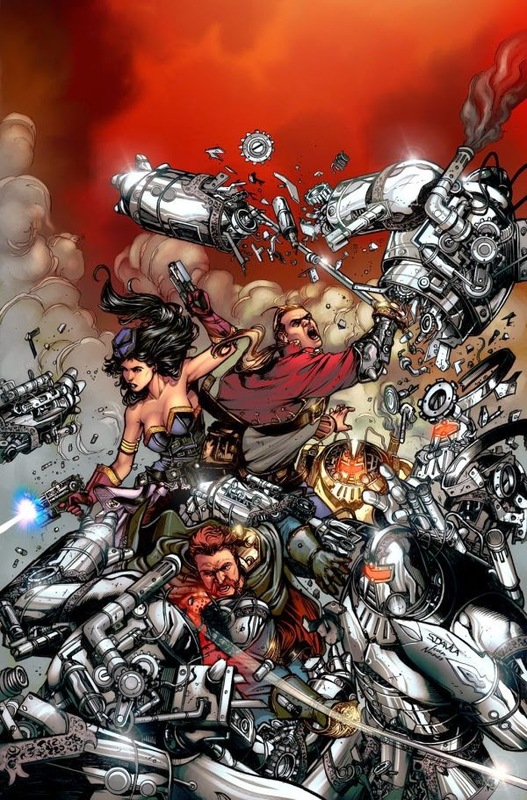 Steampunk Battlestar Galactica: 1880 #1 will be solicited in Diamond Comic Distributors' June Previews catalog, the premiere source of merchandise for the comic book specialty market, and slated for release in August 2014. Comic book fans are encouraged to reserve copies of Steampunk Battlestar Galactica: 1880 #1 with their local comic book retailers. Steampunk Battlestar Galactica: 1880 #1 will also be available for individual customer purchase through digital platforms courtesy of Comixology, iVerse, and Dark Horse Digital.